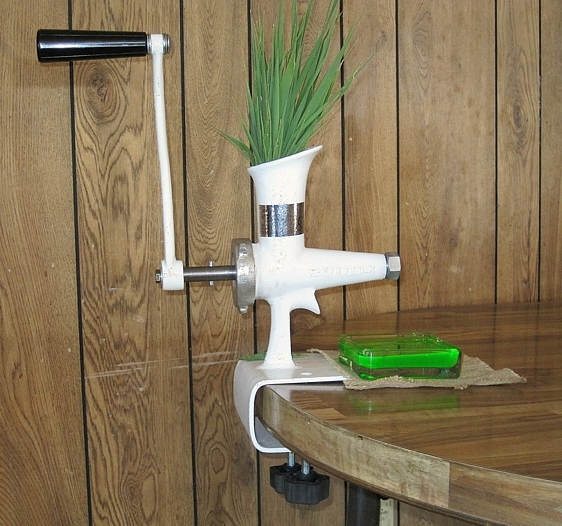 WHEAT GRASS JUICER USED FOR EITHER WHEAT GRASS OR OTHER JUICES. Made in USA. It has a stainless steel pulp separator screen. The body is made of cast iron so it will stain and rust if not properly cleaned after each use. The proper way to clean this unit is to wash it in warm soapy water and dry throughout after each use. Then apply a light coat of vegetable oil (either liquid or spray). This simple procedure will keep the juicer from staining while in storage. This juicer can be easily taken apart for cleaning in matter of minutes. A long manual handle with a large phenolic handle comes standard with this unit. Can also be retrofitted with the cast iron fly wheel for ease of operation. This quality made juicer comes complete with a table clamp for easy operation. Available in 12 different colors. Due to acidic nature of some fruits and vegetable, if some acidic fruits are processed in some cases this item may not be returnable if used. This item can be returned for full purchase refund if not used and if original packaging is available.